Many of you secretly watch shows like Miranda Cosgrove's iCarly on Nickelodeon. This is not up for debate, this is a fact of life. Whether it's iCarly or True Jackson: VP or the guilty pleasure of searching late episodes of Zoey 101 for Jamie Lynn Spears' baby bump, some of you are doing this. As such, several of you will have come across the following two commercials. Now a handful of you might even be reminded of good old LEGO sets from yesteryear. Of course there was Ice Planet explorers with their laser chainsaws and snowmobiles and bio domes, and there was even Space Colony Miner Dudez with their rockets and shiny, shiny crystals. Oh, and cops I guess. But now space cops! This is entirely new and original, you guys! But what's this? Let's take a closer look at those evil aliens. You'll notice rather easily that they are for the most part humanoid, in that they are all bipedal, utilizing the basic LEGO body and legs pieces. However they are also distinctly alien, featuring rather sinister head pieces. 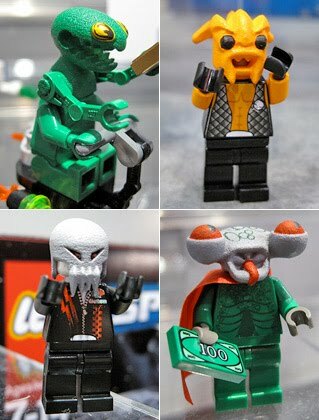 From top left clockwise we see a four-armed snarling insect, a uniquely alien snarl, an amphibious thief who appears capable of 360˚ vision and who enjoys capes and a Cthulhu/skull-faced biker of sorts. Now let us look at the Space Police members. That would be two ("white") humans and a repaint of an android body from 1995. Now ostensibly all this takes place in outer space. Since humans are not native to the vacuum of space they have to wear helmets which we see here. The aliens, mind you, do not have helmets and in both commercials are actually seen floating through open space rather comfortably (though understandably bit miffed at being apprehended). The logical extension of this, in astrobiological terms, is that these creatures are evolutionarily suited for surviving in empty space, at least for short periods of time. This implies that they are native to a thin-atmosphere environment, possibly the asteroids/small inhospitable CGI moons which appear in the commercials. From this we can assume that either A) they are the rightful inhabitants of the rocks the Space Patrol is based on, or B) they certainly have a more biologically valid right to be there. Sort of an evolutionarily manifest destiny. So how familiar is that? A bunch of pale humans get together and go somewhere new and set up shop there with all their pretty toys and enforce their laws irrespective of the local natives. Hurray colonialism! Now Edward Said was the preeminent authority on Post-Colonial theory. Is main points were that after a while white people felt bad about the whole conquering everybody thing and began to lavish praise upon native cultures for their difference, which inevitably became ultra-chique and resulted in a corruption of actual foreign culture in the minds of Westerners. Essentially, Said described a fetishization by Western society of The Other, he who is not like the rest of us, in his papers of Orientalism and Post-Colonial theory..
Said saw Western literature and experts over-grouping Eastern cultures and traditions for the sake of discourse, but misclassification, oversimplification and improper definition inevitably yielded biased views of these peoples, which when put to paper in literature and textual studies becomes thought of as canon and cyclically reinforced wrongful grouping and further stereotyped absent members of global culture. He saw the rise of The Other as a theoretical binary, defined not as something vaguely different but still entirely human, but rather defined in opposition to everything considered "Western;" "They are that which we are not." This type of binary thought is what gave a very specific feel to many images that you would easily recognize today. Disney's Aladdin was an incredible movie adaptation of a great legendary tale, featuring wonderful musical numbers and the rapid-fire voice acting of Robin Williams. However, observed carefully we see that the title character is a suave and witty character possessing an American accent and rather Caucasian facial features for a logically Middle Eastern person. His nemesis Jafar, meanwhile, has a lean, lanky frame and pencil-thin mustache reminiscent of Flash Gordon's Ming the Merciless. Additionally an evil wizard who employs talking animal familiars and a serpent motif, Jafar is imbued with distinctly anti-Christian symbolismif for no other reason to make sure a Western audience hates him. Conversely, Agrabah's royal guards are comically shaped, inept and violent scimitar wavers, brutal in their execution of execution. The Sultan, meanwhile, is politically and literally tiny and insignificant, easily distracted or coerced and oblivious to the vile machinations of his grand vizier. His daughter on the other hand is essentially a testament to the wonder and civility of the British Colonial system and the kindness, intelligence, and class equality it immediately bestows on brown people. Now let's look back at our aliens: a grimacing mantis, a violent thing with dreadlocks and big lips, a greedy serpent and a slant-eyed barbarian. It is actually a commodification of The Other, literally selling to Westerners a fetishized version of what he sees as the opposite of himself, some snarling, dehumanized beast uncaring and unfettered by puny human legal systems. In space. Edward Said postulated a more hopeful literary theory, Modernism, as a time when Western modes of thought are forced to recognize the validity of The Other not as a binary but as an equal, and that neither's mode of thought encompasses the entirety or even the correct view of human experience. I dream of a world in which little LEGO boys and little LEGO alien girls can bathe in the same spring of little blue bricks. 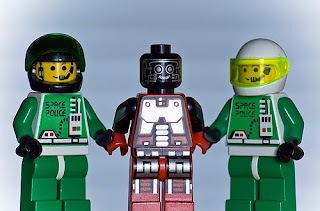 I dream of a world where there is no need for a LEGO Space Police force, because every LEGO being is imbued with love for the sacred gift of basic living dignity. Also, they get laser chainsaws.